The following article appeared in the Sydney Morning Herald on Tuesday 14 August 1894. The journalist using the pen name of “The Spectre”, accompanied by a photographer − we assume is Charles Kerry as indicated on the postcard − travelled by train to Berowra Station to then make the arduous journey down to Waratah Bay. 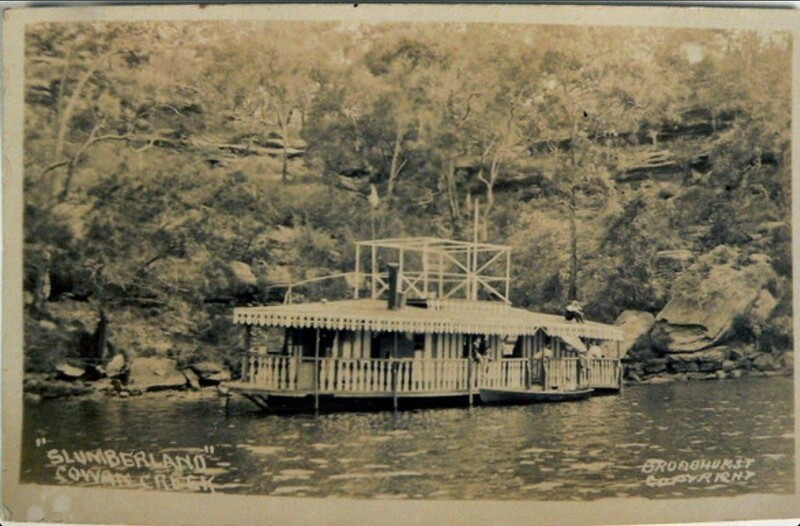 The following extract sourced from the original article provides a unique insight into the beginnings of tourism in this area made possible by the construction of the train line between Sydney and the Hawkesbury region. Berowra Station opened in 1887. The article also refers to Indigenous occupation of the Cowan Creek area evidenced by the various rock engravings and burial sites described within the piece. The low scrub and the Australian heath are all around us, and as the train stops it seems as if we had halted in the wilderness. There is not a sign of habitation, only the little shed which serves as an apology for a railway station, and far below us we can catch a glimpse of blue water, a boat here and there glancing over its surface. This is where the dozen or so passengers who have just gotten out of the train are bound, for there is nothing to tempt anyone to stay on the platform. Berowra, at present is little more than a name, the nearest stopping place on the railway line from which one can reach Cowan Creek. There are no settlers here about; in fact, there is little to induce any one to settle, for the country, ever since we left the fertile patch around Hornsby, has been of the same arid character. The Hawksbury sandstone is remarkable for it’s fertility, and here one has it at it’s best, or rather worst, for the soil is only good enough to grow bottle brushes and epacris, and cultivation is out of the question. The passengers are merely passers through, fisherman bound for the creek, and as a highly- coloured and slightly imaginative signboard informs us, we can obtain boats below. But the signboard does not tell us one thing, the nature of the path, which has to be faced before the creek can be reached. It is almost a precipitous descent, winding down the mountain side and exploring the recesses of a gully, which under its natural conditions must have been pretty well inaccessible. A friend of mine, after his first visit, assured me that it was much easier to ascend than descend the path. The next time I met him he was toiling upwards, laden with a heavy portmanteau and a miscellaneous assortment of fishing gear. As well as his scanty supply of breath would allow him, he frankly admitted that he had quite changed his views on the subject, and would, after his present experience, make half a dozen descents than one ascent! The fact remains that the path is a terrible to all but the stoutest climbers. It is the one great drawback of this route, which is much the speediest way of reaching the best fishing grounds of the creek. Hence there is little or no luggage to be seen; the fishing enthusiasts have only there bags. The boatshed at the bottom (Windybanks) is a curious and picturesque jumble, looks as if it had been made out of odds and ends of timber, roughly put together, on the hillside, amid a profusion of flowers and ferns. The ducks and geese, fat with the fish from the creek, which they will persist in eating despite all orders to the contrary, ramble at will about the place; and a big beagle hound, when he is not away in the bush hunting wallabies, receives you with the gentle courteous hospitality peculiar to his breed. The bees on their laden way back to the gin case, which serves as a delusive and constantly robbed home, flit in swarms across he path. They are so energetic in their actions, and honey-yielding plants are so plentiful in the bush, that they actually succeed in filling their case with honey. The passion fruit vine clambers at will all over the sheds, and the abutilon, which blossoms down here all year round hangs it’s bell like flowers in tempting proximity to your hand. But the fishermen notice none of these things. They are, poor fellows, possessed of the fishing fever, which, when once it enters into a man, drives out all sense of the picturesque, and blunts, or entirely destroys, the sensitive side of his nature. Your amateur, when he is badly attacked, thinks more of black bream than of bush beauties: Schnapper, in his opinion, is vastly more important than scenery, and he rushes to the boats like one distraught. In an incredibly short space of time every craft belonging to the place is filled, and the parties are soon scattered about the branching creek, which has inlets enough to bide all the boats in Sydney harbour. Turn which way you chose in Cowan and the outlook is always superb. Certainly there is room for the charge of sameness so generally brought against Australian scenery; but then the sameness is majestic, and one would hardly wish to vary it. Once past the heads, leaving the oddly named Jerusalem Bay on the right, the inclining shores shut out all view of the open waters beyond. For the rest of the time one is landlocked in a lake of the brightest blue, hemmed in by huge masses of precipitous rock, clothed with the dull dark green of the eucalypts. It is no new discovery this Cowan Creek, though many people, on hearing that the Government had very wisely made a second national park of the surrounding district, imagined that an entirely unknown country was to be opened up. 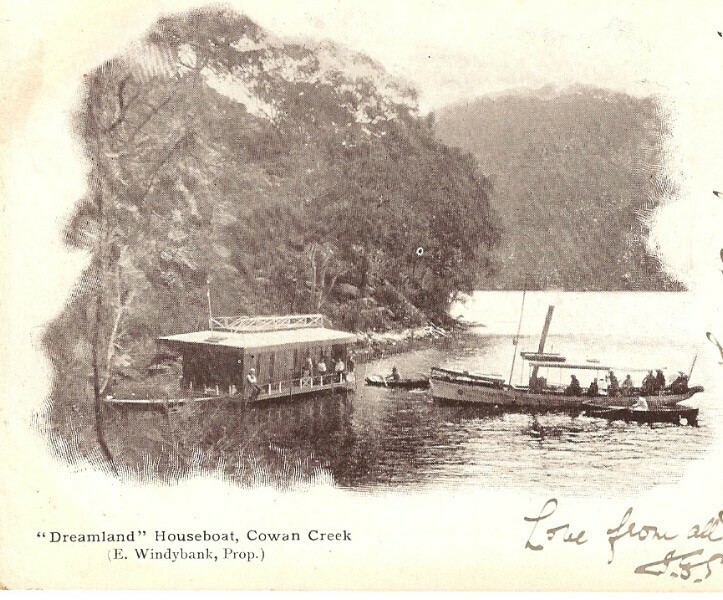 For years past the creek has been a favourite resort for yachtsmen, but until the northern line was taken through to the Hawkesbury, it was difficult to reach the place in any less expensive way. Even then, though the creek was brought within little more than an hour’s journey from Sydney, it was not so easy to get about it, since no boats could be obtained. Two or three years ago, however, an enterprising boat builder (Edward Windybank) noticed the deficiency, and the result is that any part of the creek can now be visited at a minimum of expense, and with less difficulty than is involved in getting from one suburb of Sydney to another. Dark openings on the hillside indicate at every turn the presence of caves, and in these weather worn hollows one will almost invariably find traces of the modern camper, the inevitable jam tin and beer bottle, or it may be the ashes of a recent fire. Naturally the picnicking Harry, like his prototype in the old country, leaves his name behind, as if it were a matter of interest for anyone that he had slept and shivered there for a night or two. The only value attached to these inscriptions are the dates, showing that over thirty years before people had the determination to find their way into this region, which must have been almost inaccessible. All this however, is a matter of to-day, since 30 years counts but as a moment in the real history of the place. The very name which Mr. Copeland has given it is indicative of its previous occupancy, though for how many centuries the Ku-ring-gai tribe lived and fought and fished and lived out their lives among these cave-pierced hills no one can tell. On every hillside, beneath every hollow in the rock, one sees growths of the long, rank grass which flourishes on kitchen middens of the Aboriginal [people]. One can see clearly, as a section is made through the stuff, the places where the aboriginal fires were lit, perhaps centuries ago; then another layer of ashes, which must have been years in accumulating; then again more ashes and so on. I tried to comment but it didn’t seem to work. That’s a beautiful piece of descriptive writing today about Waratah Bay. Thank goodness the Government at the time chose to declare it a National Park. I look forward to my Friday emails from you guys. Thanks for your hard work!